There isn’t an actual procedure called an honest-ectomy. But when you hear allegations about scammers who solicit donations for veterans’ charities and then pocket the contributions, you’ve got to wonder. The FTC, 54 Attorneys General from all 50 states, the District of Columbia, American Samoa, Guam, and Puerto Rico, and 16 additional state agencies that oversee charities have joined forces to announce Operation Donate with Honor – a coordinated effort to target fraudulent and deceptive fundraising for military and veterans causes. As part of the initiative, the FTC has published tips for businesses and new resources to help ensure your corporate and individual contributions truly benefit servicemembers and vets. 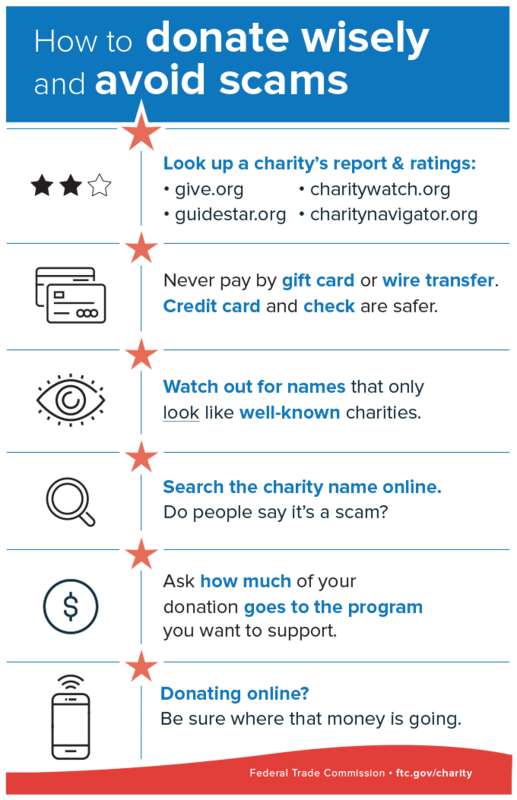 Look up a charity’s report & ratings. Check ‘em out on sites like the BBB Wise Giving Alliance, Charity Navigator, CharityWatch, and GuideStar. Take a few minutes now to watch the new video and hear what two veterans have to say on the subject. And share tips with your social network to help ensure that contributions – including donations to groups serving servicemembers and veterans in need – go to the many reputable charities worthy of your generosity.